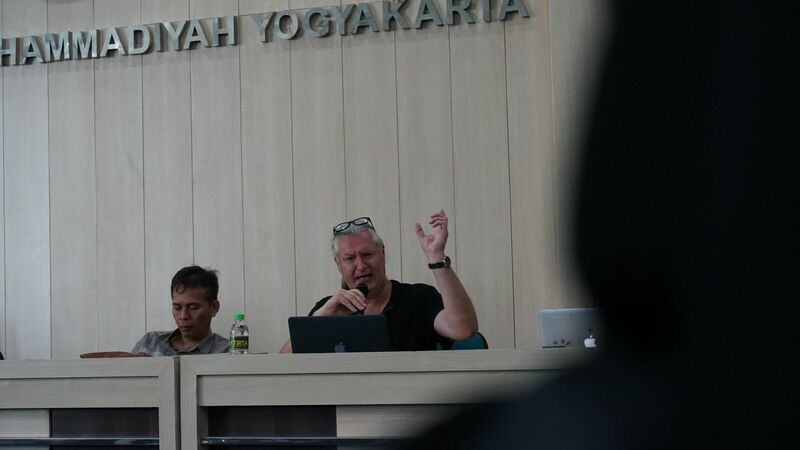 Department of Communication Science of Universitas Muhammadiyah Yogyakarta (UMY) commenced its first lecture at Room E.7 of Ibrahim Building by inviting a Dutch anthropologist Dr. Bart Barendregt from Leiden University. Dr. Bart delivered a lecture on “Social Media in Moslem Southeast Asia”. Attended by all freshmen of the department, the lecture aimed to understand Islamic civilization in Southeast Asia through social media. At the lecture, Dr. Bart presented his research on the issue and it was the first time he visited UMY. He told when he began to conduct research on Islam. Southeast Asia was selected as his research setting since the area has the largest Muslim population. “I firstly started research in Sumatra. I went to Padang to research Silat, particularly dealing with martial arts and the correlation between silat and Islamic tradition. The research triggered my interest in studying Islam in Indonesia further,” he stated. Meanwhile, Dr. Bart started being interested in social media in 1998-1999 because Islam begun using social media for dakwah. Thus, he wished that students of Department of Communication Science of UMY could be critical of confronting Islam phenomena on social media. Dr. Bart mentioned that technology is now utilized to show one’s religious personality, Islamic modernization brings huge effects on Islamic civilization on social media, and Islamic phenomena on social media do not always demonstrates positive aspects and rely on people’s behaviors towards to the phenomena. “Several phenomena such as hijab and hijrah emerge on social media. Social media can be employed to encourage people to recite Al-Qur’an, and there are a lot of Islamic-based applications. If students would like to do a research project, I recommend you to avoid issues of Islamic politics. You had better discuss Islam in daily life,” suggested Dr. Bart. He also expected that his explanation can be valuable for students’ research on the influence of media on Islamic civilization.